It has been a decade since the National Academy of Education lastissued a review of education research. This new volume arrives at acritical time for our nation's schools. More than twenty prominentscholars provide an overview of the tensions, dilemmas, issues, andpossibilities that currently characterize education research. Theyexamine the state of education research, discuss how it is changingand where it needs to go, and reveal how the results ofresearch--whether good or bad--have become key drivers ofeducational policy and practice. This revelation raises importantquestions about standards for sound research and training forfuture researchers. Issues in Education Research is a valuablereference for the more than 40,000 college faculty members whostudy schooling and prepare tomorrow's teachers. ELLEN CONDLIFFE LAGEMANN is professor of history and education and director of the Center for the Study of American Culture and Education at New York University. She is also president of the National Academy of Education. LEE S. SHULMAN is president of the Carnegie Foundation for the Advancement of Teaching and professor of education at Stanford University. He is a past president of the National Academy of Education. 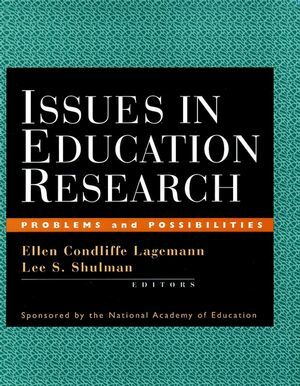 Introduction: The Improvement of Education Research: A Complex,Continuing Quest (E. Lagemann & L. Shulman). EDUCATION RESEARCH AS A PROBLEM IN THE HISTORY AND SOCIOLOGY OFEDUCATION. An Auspicious Moment for Education Research? (E. Lagemann). Research and Purposes of Education (D. Cohen & C.Barnes). Poles Apart: Reconciling the Dichotomies of Education Research (T.Mitchell & A. Haro). Needed: Thoughtful Research for Thoughtful Schools (D.Meier). CHANGING CONFIGURATIONS IN EDUCATION AND SOCIAL RESEARCH. Sociology and the Study of Education: Continuity, Discontinuity,and the Individualist Turn (C. Bidwell). From Society to School and Back Again: Questions about Learning inand for a World of Complex Organizations (E. Clemens). Understanding Educational Processes in an Era of Globalization: TheView from Anthropology and Cultural Studies (K. Hall). EDUCATION RESEARCH AS A VOCATION. Professing Educational Scholarship (L. Shulman). The Core, the Canon, and the Development of Research Skills: Issuesin the Preparation of Education Researchers (A. Shoenfeld). Discipline and Disciplines in Education Research--Elusive Goals?(S. Heath). Culture and Commitment: Challenges for the Future Training ofEducation Researchers (V. Walker). Preparing Education Practitioners to Practice Education Research(A. Neuman, et al.). THE ORGANIZATION AND COMMUNICATION OF EDUCATION RESEARCH. The Changing Infrastructure of Education Research (A.Collins). Research, Reform, and Aims in Education: Modes of Action in Searchof Each Other (J. Greeno, et al.). New Media Communications Forums for Improving Education Researchand Practice (R. Pea). Multiples of Evidence, Time, and Perspective: Revising the Study ofTeaching and Learning (D. Ball & M. Lampert). Postscript: Some Reflections on Education Research (J. Bruner).